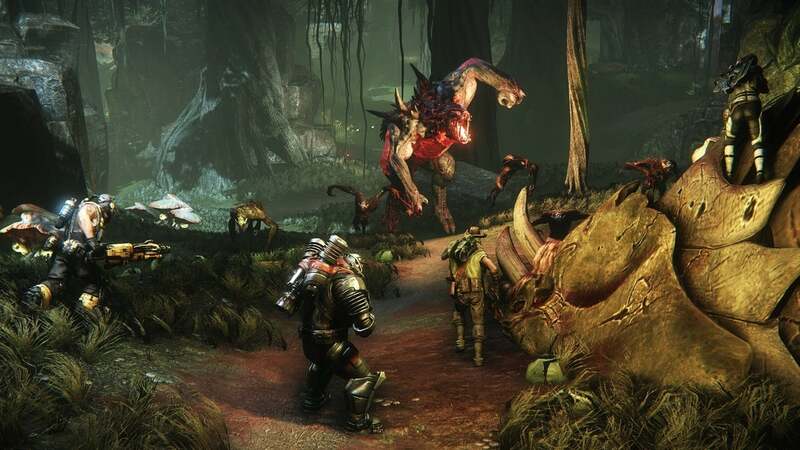 Evolve, a team-based shooter about giant monsters, was first released in 2015 as a paid standalone game. Then it went free-to-play. Now, it's going to keep on going without the help of the people who actually made it. Developers Turtle Rock have posted a letter on the game's forums saying "unfortunately today is the last day that Turtle Rock Studios can work on Evolve". The language in the letter is weirdly vague, never explicitly saying that the game is being shut down, or sold, or handed over, or whatever. All it really states with clarity is that Turtle Rock, the team that created Evolve - and carried it from THQ's collapse to 2K - will no longer be working on or directly supporting the game. A question from a fan wondering about the situation is answered in more detail by the game's Community Manager, Shane Kali Meyer, who responds "2K ended our contract. We wanted to continue working on the project." 2K's blog post on the transition offers more detail, essentially confirming that Turtle Rock won't be working on the game any longer, and that support for Evolve's PC servers will continue "for the foreseeable future". It also says 2K will "continue to evaluate the possibility of bringing the [free to play] experience to consoles in the future, though right now our focus is on bringing in new players and maintaining the game's audience on PC." This is the second time in a row that Turtle Rock have had to leave a game of theirs behind in the hands of a publisher; they created Left 4 Dead before it was signed by Valve, and are now leaving Evolve's IP with 2K. Eh, never liked the look of it but tried it when it went free to play. Jumped in with a friend who had purchased the game before and told me he loved it. After playing free to play for a couple hours we were both thoroughly bored, he said it was more fun before. Just sounds like a dead game is dying. That game had a cool logo. It's a bit sad that such a cool concept for a game turned out so poorly (bit like Hellgate a few years back). I love idea of getting to play the monster. But if they don't get the actual gameplay right then a good idea doesn't translate into actual fun. I made the mistake of buying this game - realised how boring it was and sold it. It really needed a co-op campaign. It was pretty stupid of them to make it free to play on pc but not consoles though - should be all f2p or not at all. I found the game amazing at launch, bought it with a group of friends. It's a game that's definitely meant to be played with a group of your buddies and practiced to get right. Matchmaking system with randoms usually ended up with a lackluster feel. Had a huge blast leveling all characters up and the first character dlc's were great. Noticed some serious balance issues that got me less interested in the game at one point. Have yet to try it with it's new revamp. Definitely was one of my favorite multiplayer games. Sick concept, sick models, good times. Many hilarious wtf moments, gets super intense. Many friends eaten by random wildlife.